meet the requirements of EN54 Parts 2 & 4.
photoelectric, photoelectric-thermal and heat detectors. another and that the full range of system functionality is supported by each device. ?8?0 2 conventional input zones. ?8?0 1 notification appliance circuits (NAC) with built-in synchronization forANSI 3.41and Gentex. ?8?0 The panel comes with a 2 amp power supply. ?8?0 Dedicated alarm and trouble relays. ?8?0 1 RS485 can be able to connect the other panel. ?8?0 Housed in a 205mm W x 258mm H x 81mm D metal enclosure. ?8?0 Enclosure supports two 12V, 4Ah backup batteries. 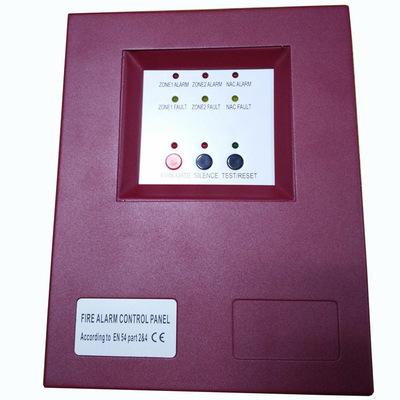 ?8?0 The panel can be used independently or connect by RS485.